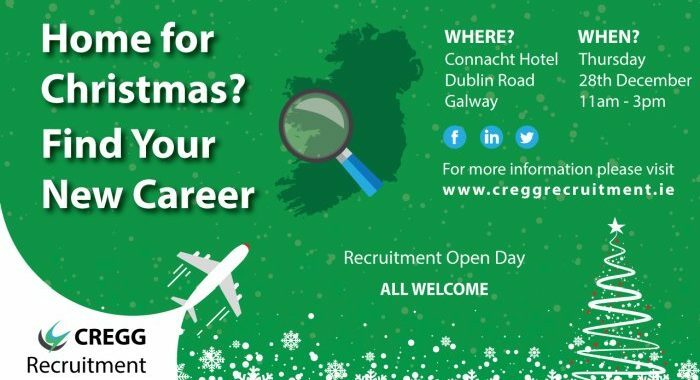 Over the festive period, leading Irish recruitment firm CREGG Recruitment will be hosting a recruitment open day. The event will take place in the Connacht Hotel, Dublin Road, Co. Galway on Thursday the 28th of December from 11am-3pm. “Over the past 12 months we have seen a significant increase in the number of Irish people abroad looking to move home. It is a very big decision and clients tell us it can be difficult to access information on career opportunities when they are abroad,” according to Senior Recruitment Consultant at CREGG Recruitment, Aisling Conroy. For this event, CREGG Recruitment have partnered with LookWest.ie and Fenero. LookWest.ie provides information for individuals setting up a business, investing or looking to relocate to the West and Fenero are one of Irelands leading providers in tax solutions for contractors. CREGG Recruitment work with many leading SME and multinational companies across Galway, Clare, Limerick, Cork, Mayo, Sligo, Roscommon, Westmeath, and more. They have many open roles and are currently recruiting within various areas including Management, R&D, Quality, Manufacturing, Engineering, Equipment Design, Projects, Process and Maintenance Technicians, IT, Human Resources, Supply Chain, Finance, Marketing, Customer Service & Languages. To make the most of your day at the event, all attendees are advised to bring a CV.